This week we pit the German capital against the City of Lights, in three arbitrary rounds: prettiest city, best snack food, and best weekend getaway. Paris takes round one with no contest, but Berlin still has some fights in her. Round two is quick, staple snacks, and it’s a unusual showdown. The perverse delicacy of bratwurst covered in curry powder and ketchup, or the light breakfast pastry that you can eat all day. The currywurst speaks to Berlin’s dynamic post-war history – it was invented by Herta Heuwer in 1949 out of a random assortment of ingredients that she received from British soldiers. It fueled the construction workers who rebuilt the city, and could arguably be considered an early example of German fusion cuisine. The croissant, on the other hand, could actually be considered an import to France, with a lineage traceable to the Austrian Kipferl as far back as the 13th century. The name comes from the French word for crescent, and one theory is that its shape represents the Islamic crescent, and that it was invented in Vienna to celebrate the defeat of Ottoman forces in the 17th Century. Given its definitely-German origins, the snack round goes to Berlin and the score is 1-1. With points even, we enter the third and final round on something we can be a bit more objective about – which city makes a better weekend getaway? Now, to a certain degree we’re comparing Apples with Oranges here, so let’s boil it down to prices. A three star hotel in Berlin for two nights will set you back around €100-€250 for two people. For a similar room, Paris will run you a fair bit more, with prices of €250-500 depending on the area. You’ll want to see a bit on your weekend, so you’d be best advised to pick up a all-in-one transport/attractions pass. The Berlin Welcome Card is a great option – a 48 hour transport pass plus 25%-50% reductions on over 200 attractions, and it costs just €17.90. In Paris you get a bit more with the Paris Pass: again 2 days unlimited travel on public transport, plus free, priority entrance to 60 attractions, including a hop-on hop-off bus tour and a wine tasting. But at €99 per person, the Paris Pass takes a much bigger chunk out of your spending money. 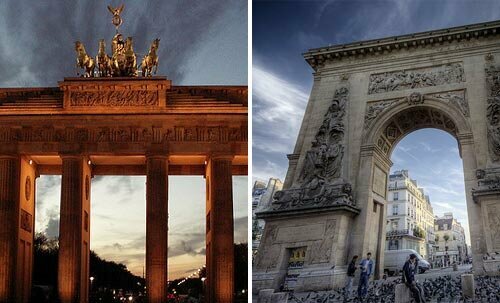 Paris can’t be beat when it comes to romance and beauty, but the title goes to Berlin for the glory of a currywurst and its kindness to your finances. This entry was posted in Leisure and tagged Berlin..